Your library liaison would like to work closely with you to purchase books, journals and media to support your classes. They can also provide library instruction for your classes, and meet with you to help with your research and show you library resources. 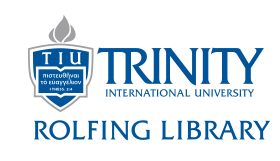 The books page will show you how to find books in Rolfing Library, request them from other libraries, and access e-books. The library has access to many databases and online journal articles, which can be used in your classes. You can access media both in the library and online. The library provides streaming videos, audio books and music. Learn how to place books on reserve for your classes. You will need to create different accounts to use the library.You may also authorize your student assistants so they can check out and request books on your behalf. Your library liaison can provide a variety of instruction for your class, including in-person instruction, online research guides, and tutorials.